5 Best Roatan Cruise Excursions Not To Miss! Roatan is one of Honduras’ biggest islands and is known worldwide for its phenomenal diving sites and crystal waters. Whether you arrive via a Carnival Western Caribbean cruise or on any of the many other liners that stop at this port, taking in a Roatan cruise excursion will allow you to see the many sights that make this Island something special. Whether you enjoy touring new ports of call, relaxing on the beaches or you are looking for an adventure, this island has it all. Here are the top 5 cruise excursions not to miss on your cruises to Roatan. One of the top things to do in Roatan is to take advantage of both the beaches and the inland areas. When you go on the Zip n’ Dip Canopy tour you are doing just that. Go by zip line through the jungle on a 1.8 mile run, going from platform to platform. When that part of the tour is over you are taken to a beach with crystal clear waters and warm sand to relax or go for a swim. Why not take advantage of those crystal clear waters and snorkel among the marine life and coral reefs that make the area famous? A snorkeling tour of West Bay and Sandy Bay, a four hour excursion takes you to these two bays for a myriad of sights. Roatan cruise excursions also take a relaxing turn if you choose the horseback riding tour on the beach. Take a leisurely ride along the sundrenched sand while your guide tells you the interesting things to look for on the way. A Roatan Mangrove tour leaves by boat and allows you to visit the oldest fishing village in all of Honduras, Oak Ridge. Travel along and see the homes, wildlife and marine life that make the area famous. For the more adventurous, you can see Roatan from the air on the West Bay Parasailing excursion. Soar high above the ocean, see the world’s second largest coral reef from the air and then relax on a white sand beach. 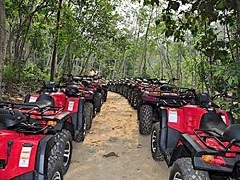 Roatan cruise excursions really have something for everyone. Roatan is included in many itineraries on Western Caribbean cruises because it has so much to offer and makes for a colourful and adventure- filled day off of the ship. Because of the tropical climate, friendly people and interesting sights, a Roatan cruise excursion should definitely be built into your plans when you head to the islands of Honduras.